Now Available for FREE: Download The CB App for the BlackBerry PlayBook!! 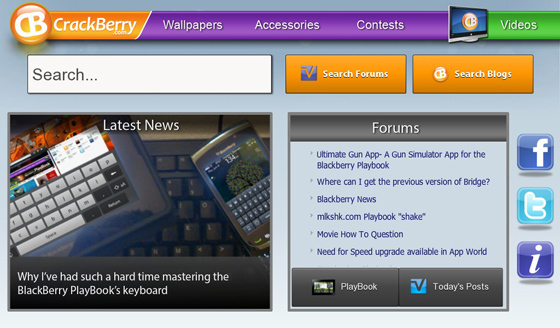 Download the Official and Free BlackBerry PlayBook App for CrackBerry.com! OK BlackBerry PlayBook owners, it's time to fire up your tablet and head to App World to download The CB App! Our friends at ShaoSoft put this one together for us, and it's a CrackBerry must-have. The CB App takes the best of CrackBerry.com and puts it into a nice dashboard app that gives you the latest news, forum and video content and gets you to where you want to go quickly. Scrolling feed of the latest Blac​kBer​ry Play​Book​ discussions from the forums. It's off to a great start and is only going to get better as we add deeper integration and rollout some additional new features. For the whopping cost of FREE OF CHARGE, this one is a no brainer - EVERY PLAYBOOK OWNER SHOULD DOWNLOAD THIS APP. Follow the link below or just head to App World and search for crackberry or cb. One of these days I'd sure love to see RIM just let us put the CrackBerry name in App World... but in the meantime, remember, it's THE CB APP. Now go download it and be sure to give it a 5 star rating and positive review!